These cup cakes are made of butter vanilla cupcake recipe, brushed with apricot jam, and covered with fondant. The figures also are made of fondant (they are my personal creation). I made 100 cup cake for a hand crafts exhibition. I hope you will like them. Editors Note: I love all of the little animal creations on top of the cupcakes. They are so darling and cute! It looks like it took a very long time to create all of them. Well done! 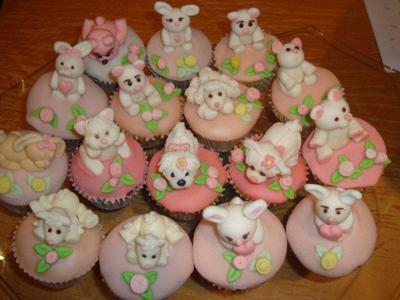 I like the way you baked these animal cup cakes. You show alot of creativity in baking. I will let my friends in on this recipe. Thanks so much.